Ionotropic glutamate receptors (iGluRs) are ligand-gated ion channels that mediate the majority of excitatory neurotransmission in the central nervous system, and their dysfunction is associated with neurodegenerative conditions such as Alzheimer’s and Parkinson’s, movement disorders, psychiatric disorders, epilepsy, and stroke-induced trauma. Our interests are primarily in AMPA-subtype iGluRs, which are responsible for the initial post-synaptic depolarization in excitatory neurotransmission. We are particularly focused on the gating process of AMPARs, a process that starts with binding of a ligand to the receptor, and ends with opening of the ion channel pore for the flow of permeant ions. Also of interest is how the function and pharmacology of AMPARs are affected by interactions with their auxiliary regulatory proteins. 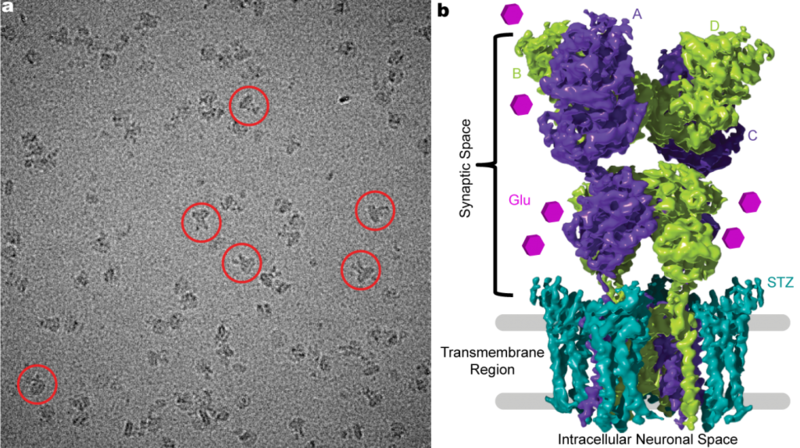 We aim to provide additional insights into these AMPAR functions in order to understand the pathophysiology of excitatory neurotransmission, a key barrier in informed therapeutic design targeting disease states, using a combination of cryo-electron microscopy (cryo-EM), X-ray crystallography, kinetic modeling, and electrophysiology approaches. Transient Receptor Potential (TRP) channels are a superfamily of ~28 different ion channels. Some TRP channels gate in response to heat, cold, mechanical force, and/or pungent chemicals, implicating these channels as molecular «sensors» of environmental cues. In addition, TRP channels play important roles in a wide variety of other physiological processes, including calcium homeostasis, neurite outgrowth, and hormone secretion. We aim to examine TRP channel structure-function mechanisms using a range of biochemical and biophysical approaches, including X-ray crystallography, cryo-EM, and electrophysiology.